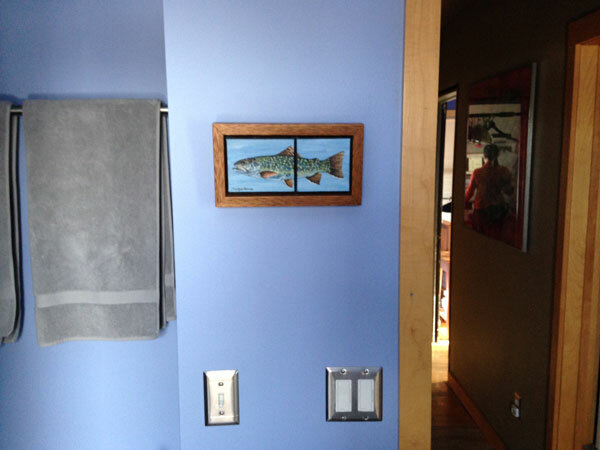 After twenty years my wife and I felt the burning need to give our bathroom an elegant overhaul. We started with the paint. After much discussion we decided on a silvery periwinkle to go with our satin chrome fixtures, towel bars and switch plates, and to complement the maple trim. Next we chose towels. Here we went with a silvery gray to match our existing 2×2 tiles in the bath surround. That left us with the problem of a teal plastic laminate countertop. We tossed around the usual options of stone and solid surface materials, but we wanted something unique and with more spirit. We finally decided to simply overlay the existing counter with a sheet of bead blasted stainless steel to avoid any issues of rust or surface blemishes. I carefully measured the existing counter and its sink cutouts to create a shop drawing for the new counter with its openings and folded edges. I then had it fabricated, bead blasted and clear coated. Which brought us to the install. 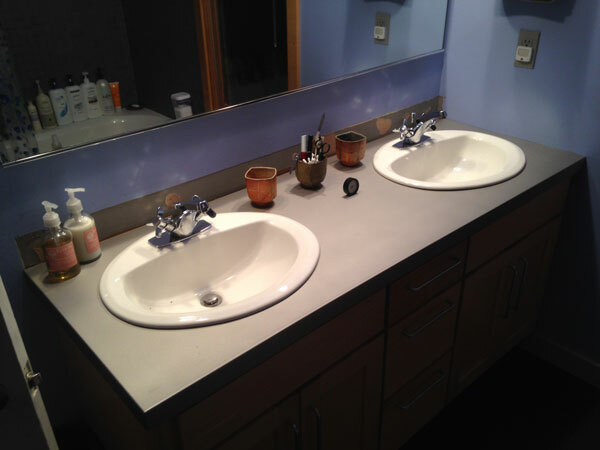 The first task was to disconnect the porcelain sinks and remove them from the plastic laminate. Well, easier said than done. The twenty-year old acrylic caulk had mysteriously turned to concrete! It took me three hours with a utility knife and a chisel to free the two bowls and clean off the caulk. After making sure that I had a nice tight fit (what I would have done if it didn’t, I don’t know) the installation began. 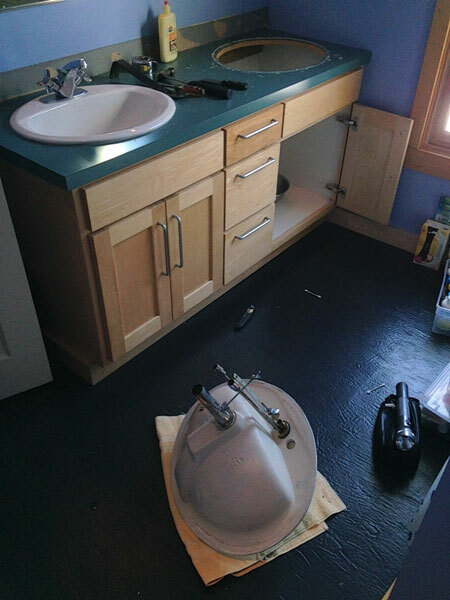 I applied clear silicon caulk at the perimeter of the existing counter as well as around the bowls and on the remaining fields of plastic laminate as well. I then very gently put the beast in place and loaded it with large books for a couple of hours. 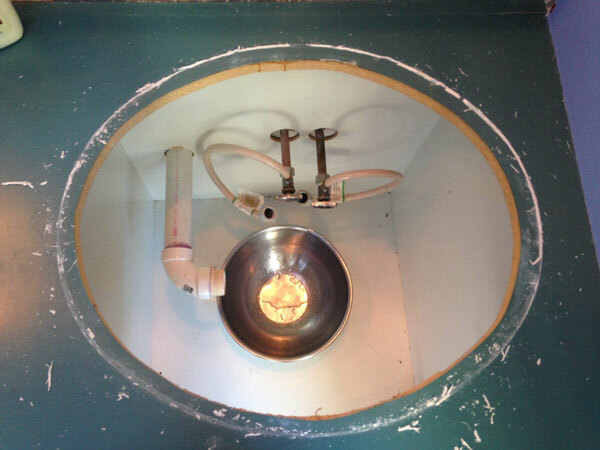 It was finally time to set the bowls and hook up the plumbing once again. 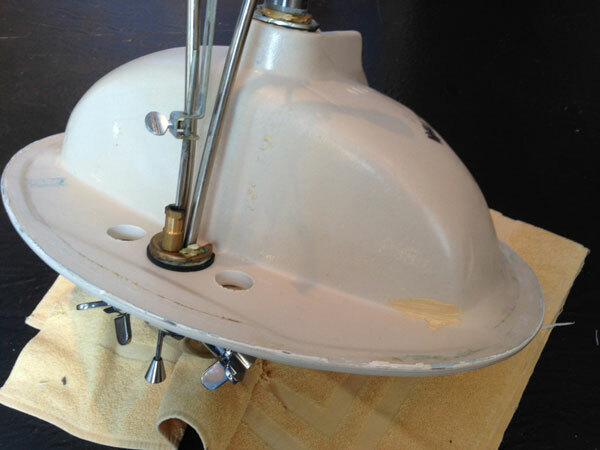 I flipped the bowls and applied a bead of the same clear silicon caulk to the perimeter of the underside of the bowls and VERY carefully set them back in place and hooked them up. Miraculously nothing leaked! It turned out to be a trifle more complicated than anticipated, but all in all it went pretty well. Magically for under $400 and a fair amount of sweat equity we now have a uniquely lustrous bead blasted stainless steel countertop to go with our satin chrome fixtures, towel bars and switch plates as well as our maple trim, silvery gray towels and our periwinkle paint. Remember? It all started with the paint.